You may also use it to find out which programs or apps did use data in the past 30 days, for instance as part of a security or privacy audit. While you can use specialized programs for that that monitor network traffic. To name a few that we reviewed in the past: Netlimiter Monitor, Networx, or Network Traffic Balancer. 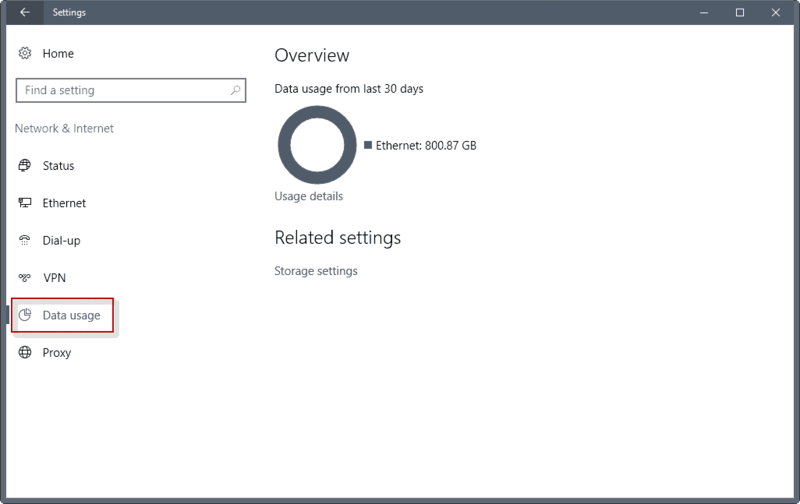 If you run Windows 10, and to a degree also Windows 8.x, you can look up basic information about data usage without installing third-party tools. 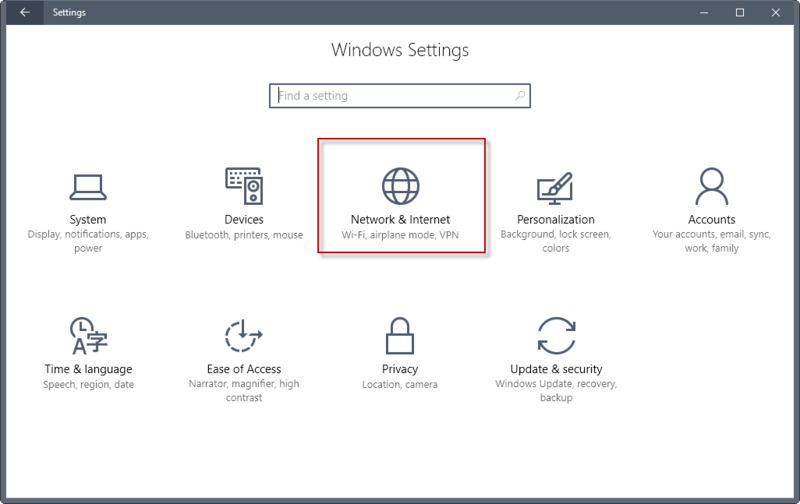 The first thing that you can do to check data usage on Windows 10 is to look it up in the Settings. You can launch the Settings app with the shortcut Windows-I. Select the Network & Internet option when it opens. Locate the data usage link in the left sidebar when Network & Internet opens, and click on it. Windows 10 displays the overall bandwidth on the page. This is sorted by adapter. If your device connects using various Ethernet ports or WiFi, it is listed there separately. Click on the usage details link on the page to open the list of programs, and the bandwidth that each used in the last 30 days. 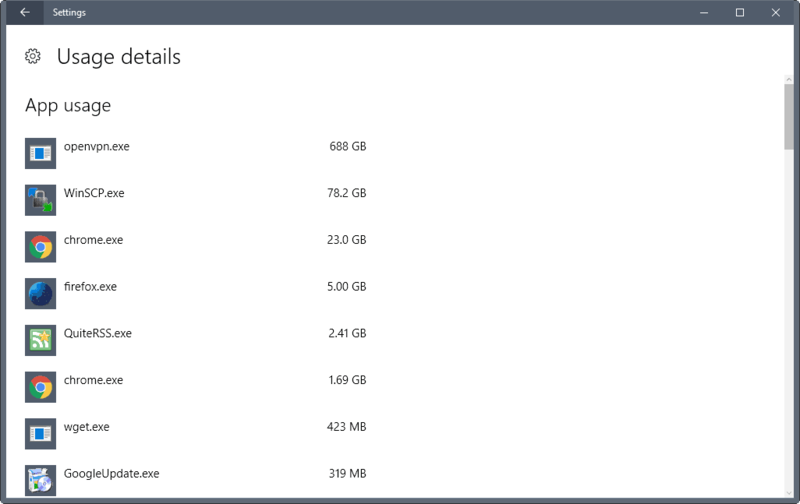 The programs and apps are sorted by the amount of transferred data, with the program that used the most listed at the top. You can scroll down on the page, but there is no 0ption to find a specific program, sort the data in a different way, or export it. The Task Manager option was introduced in Windows 8 for the first time. It is limited to the data usage (and other metrics) of applications. What this means is that you only get a list of installed (Windows Store) apps there, and not desktop programs / legacy Win32 programs. Still, if you want to find out which app used data in the past 30 days, you may find the listing useful. Use the keyboard shortcut Ctrl-Shift-Esc to open the Windows Task Manager. Switch to the App history tab when it is open. 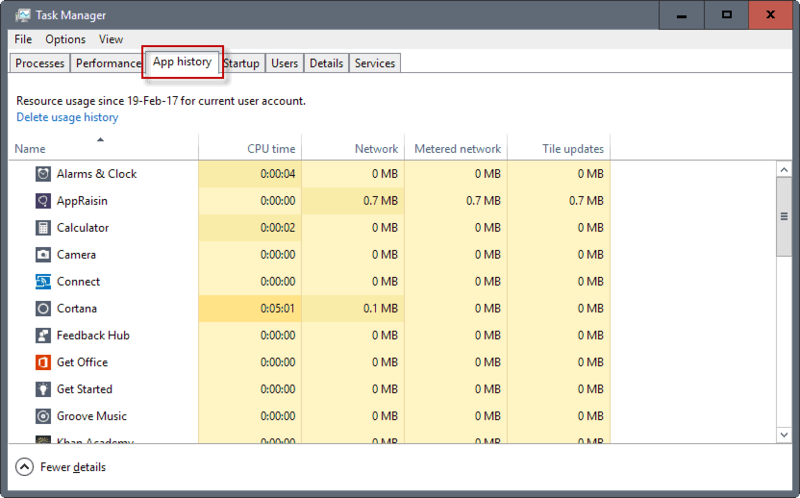 There you find listed all apps that used CPU time or network data. One advantage of the listing in the Task Manager is that you can sort the data with a click on a column title. A click on network sorts the application listing by network data usage for instance. I’m not super proficient when it comes to PowerShell, but you can use it to list the total of received and sent bytes. To start a PowerShell interface, tap on the Windows-key, type Powershell, hold down the Shift and Ctrl key on the keyboard, and execute the result from search. 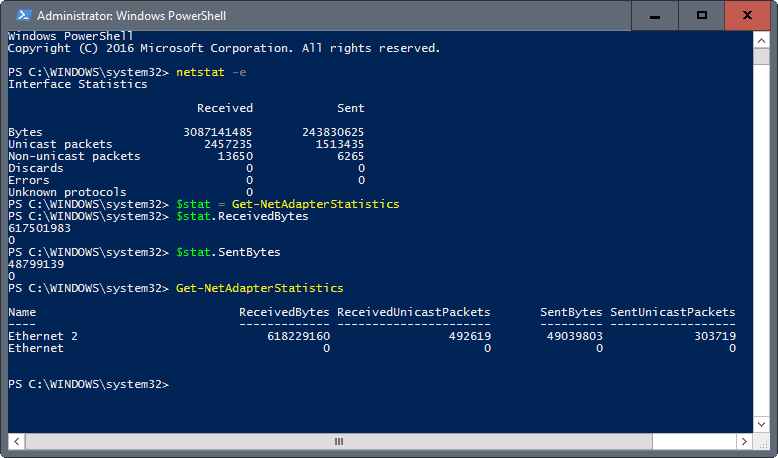 Use the command Get-NetAdapterStatistics to display data usage information for each connected network adapter. This entry was posted on Wednesday, March 22nd, 2017 at 10:19 am	and is filed under tech tips. You can follow any responses to this entry through the RSS 2.0 feed. Both comments and pings are currently closed.